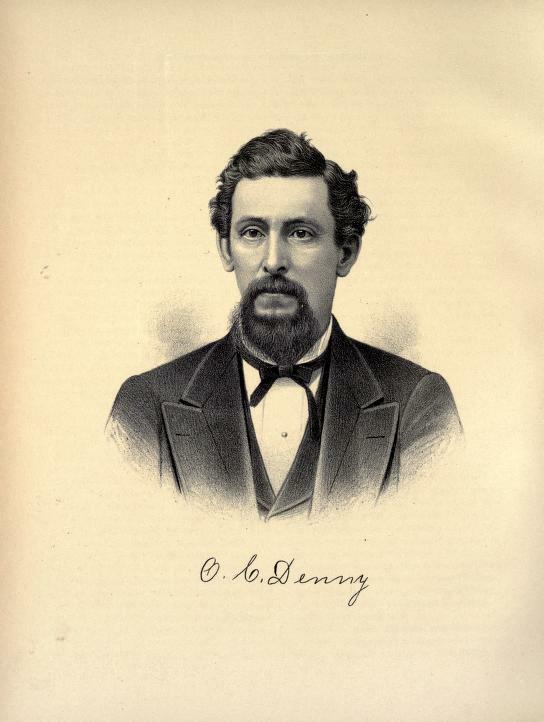 OLIVER C. DENNY. Elsewhere in this volume may be found a sketch of Mr. E. W. Denny, a brother of our subject, and incorporated in that is an outline of the family history. There is, however, so wide a divergence in the individual histories of the two men, that the reader will find no monotony in the reproduction which we shall attempt to make of the life story of the gentleman whose name is quoted above. He is a farmer living near Sorento, and, as a veteran of the late war, has a special claim upon the attention of all loyal and patriotic citizens. He is a son of James E. and Mary P. (White) Denny, a further notice of whom is given in the sketch above mentioned. Mr. Denny was born on the place where he now resides, April 30, 1830. The educational advantages of the day were not very liberal, and the young mind had to seize upon what it could get for its mental growth. When but twenty-two years of age, our subject went to Wisconsin, and his open, frank countenance commended him to the confidence of Samuel Moore, one of the most prominent business men of Prattville, Grant County. With him he remained for seven years, and during that time he was married to Miss Mary Ellen Snowden, an English woman, their nuptials being solemnized in November, 1859. Soon after marriage, the young couple went to Muscoda, Wis., where our subject was engaged in the sawmill business, and there he received the first news of the breaking out of the war. August 9, 1861, he enlisted in Company A, of the Thirty-third Wisconsin Infantry. Although joining the ranks as a private, he was soon breveted Orderly-Sergeant, afterward was made Second Lieutenant, and after the battle of Vicksburg his gallantry was rewarded by a commission as First Lieutenant. For some time he was in command of his company, and for a year and a-half served as Regimental Quartermaster, and as such was mustered out August 9, 1864. During his three years of service, he took part in many of the large battles, enduring manfully and heroically all the hardships of war. He followed Price through Missouri, and was on the Red River and White River expedition. His joy at the fall of Vicksburg was that of a patriot. His regiment was engaged during a long time in destroying railroads and on guard duty. While in service, news came to our subject that his wife had dropped dead from heart disease. Some time after this, there was a little romance that relieved the monotony of his army life, and that is worth relating. While at Tuskegee, Ala., Mr. Denny formed the acquaintance of Annie E. Wade, the cultured daughter of an extensive slaveholder and planter, and a relative of the noted Ben Wade. They became enamored with each other. It is useless to say that the Southern planter did not look with pleasure upon the attentions paid his favorite daughter by the Union soldier; but love brooks no opposition, and after the war the young lady came North, joined Mr. Denny at Cairo, Ill., where they were married August 3, 1866. She has ever since shown herself to be of the same metal that prompted her to give up luxury and affluence for the sake of the man she loved. She is now the shining light of his home, and is considered the queen not only of the home circle but of the social life in the community in which they live. After this marriage, Mr. Denny was engaged for some time in the drug business in Iowa, but finally returned to Wisconsin, where he remained until after the death of his mother in 1883. He then returned to his childhood's home, and, purchasing the equities of the other heirs, became sole owner of the homestead. The old place, which resounded in time past to the fun and merriment of a prior generation, is now gladdened by the presence of two bright children: Carney Laslie, a boy of ten years, who was born March 5, 1883, and Oliver Clinton, who will be six years old January 11, 1893. Mr. Denny is a strong Republican in his political affiliations. His army associations are kept green in memory by his membership with the Grand Army of the Republic. Fraternally, he is a member of the Odd Fellows. 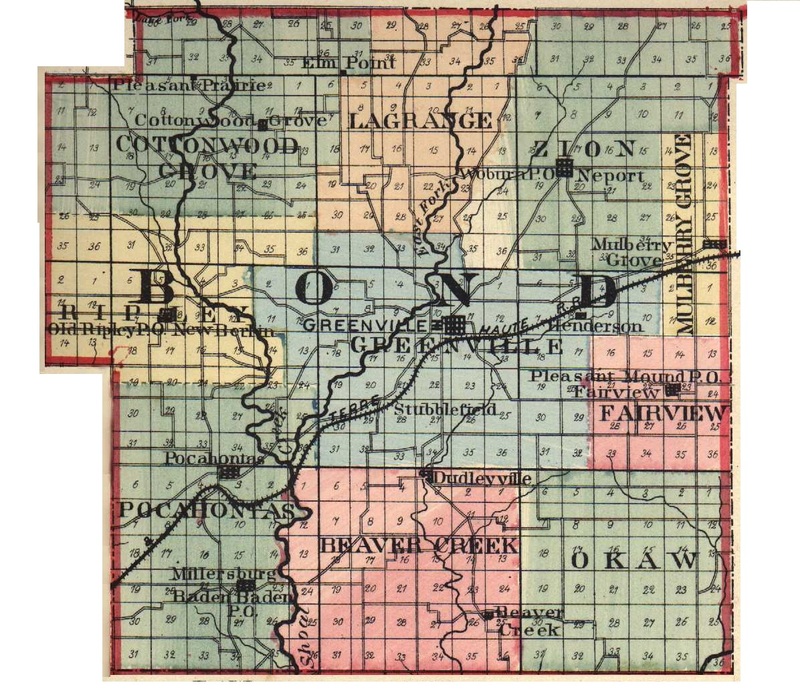 Extracted 20 Dec 2016 by Norma Hass from 1892 Portrait and Biographical Record of Montgomery and Bond Counties, Illinois, pages 432-434.